Kitchen is one of the most important corners of your home where you spend considerable amount of your time cutting, chopping, washing, and preparing meals for your family. Naturally, every homemaker wants her kitchen to look best. 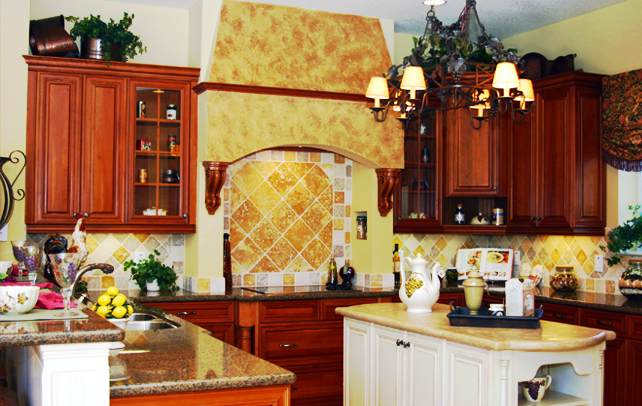 Kitchen tiles form an important part of your overall kitchen décor. 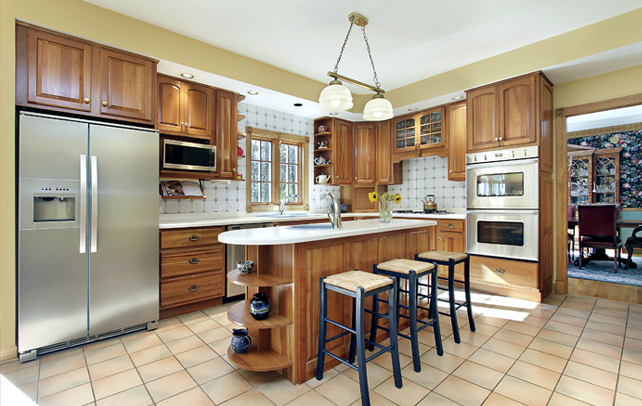 To give your kitchen a perfect look, learn about types of kitchen tiles available in the market. Choose right kind of tiles to complement the overall décor of your kitchen. 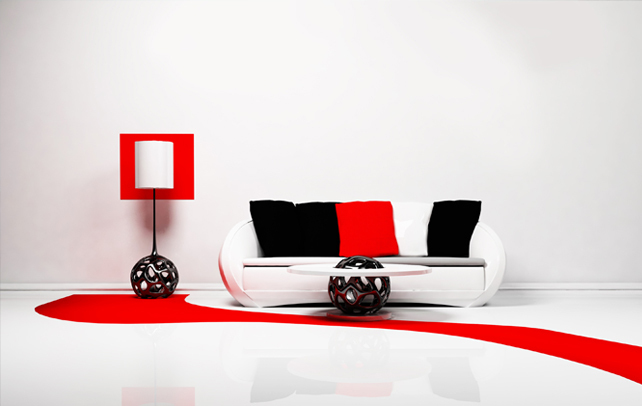 Gone are the days when people chose dark gloomy colors to conceal soot and stain caused by coal and firewood. In modern day kitchen equipped with LPG burner, stove and microwave ovens, you are free to choose any colors you want for your kitchen tiles. Kitchens tiles are available in variety of colors, sizes, textures, patterns and materials. Granite, ceramic, porcelain, slate, travertine, Saltillo, glass, metal and vinyl are the types of kitchen tiles available in the market. 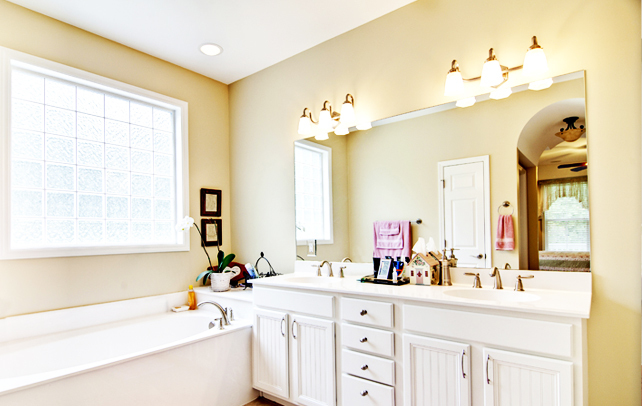 Ceramic tile is made of clay, talc and other mineral components. This kind of tile is heat resistant and durable. The surface of ceramic tile is mainly matte or glossy and comes in a variety of styles, colors and patterns. However, ceramic tile is susceptible to crack and chip. Dropping of glass or dish vessel may result in its breakage. Granite tile is excellent and highly durable. It has high maintenance value for the house owners. Granite tile coming in contact with bits of quartz on sole shoe may scratch the surface. So, granite tile requires frequent cleaning, moping and sweeping on daily basis. A natural stone slate tile can withstand high activity kitchen area. This type of tile is durable in nature, resistant to stains, scratches, and cracks. The most attractive feature of slate tile is its non-slippery surface that makes it stand out from the rest. It is available in a wide range of textures and colors, which include green, rust, gray, and charcoal black. Slate tile is ideal for those who are inclined towards giving their kitchen natural feel and look. Porcelain tile is costly, durable and chip- and scratch- resistant. This type of tile is harder than ceramic tile. Porcelain tile is a popular material for covering kitchen floor and countertops. Glass tile has become a popular choice among masses, as it is affordable and looks extremely good. The glossy, smooth finish, brightness and luminosity are some of the attractive features of this type of tile. Available in infinite designs and colors, this is the one you may consider for giving chic look for your kitchen. Vinyl tile is one for those with budgetary constraint. It comes in peel-and-stick variety and is cheaper than stone, porcelain and ceramic tiles. Vinyl tile is suitable for kitchen floor with cracks and can be easily installed without requiring any professional work. However, vinyl tile does not look as attractive as other tiles. 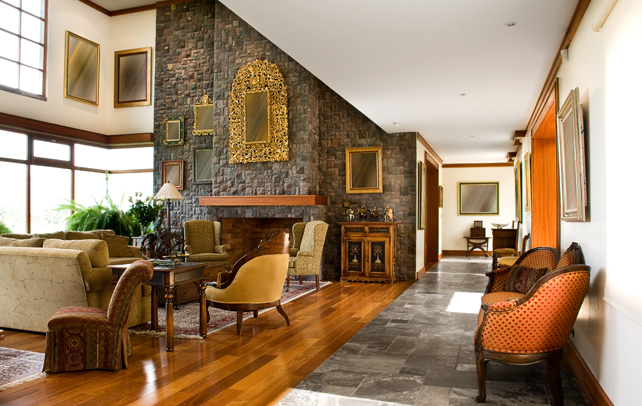 Travertine is made of limestone and comes in a wide range of colors from brown and gold to cream and ivory. It is the trendiest kitchen tile you can opt for your kitchen. Travertine tile in your kitchen must be sealed as this porous stone will absorb liquid and may result in leakage. Also, polished travertine tile can be slippery when damp. Saltillo tile is a handmade clay tile from Mexican region. 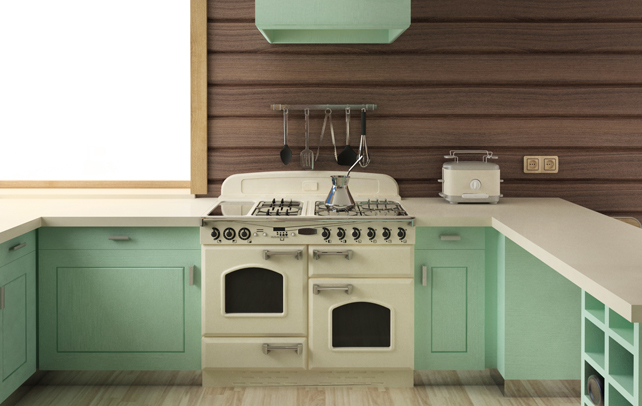 It is ideal for aesthetic look and goes well with Mediterranean-style kitchens. However, this type of tile may not be practical alternative as it is fragile in nature and can break easily. Metal type tile looks great with kitchen stocked with many steel appliances. Metal tile comes in different patterns and designs. This kind of tile will impart a contemporary look to your kitchen. 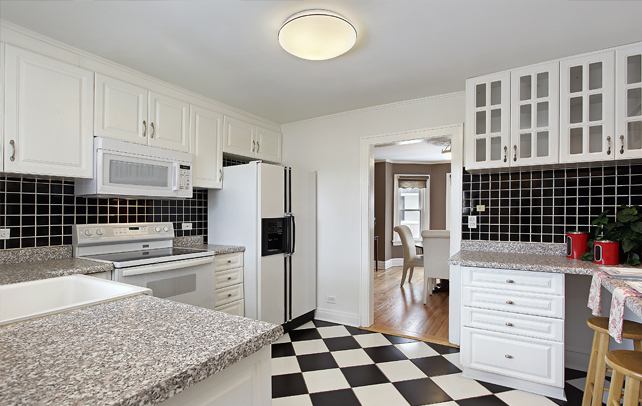 The newest trend in kitchen tile is the mosaic tile. It can be custom-made to suit your taste and style. Before venturing out for shopping your kitchen tile, do a bit of homework on pros and cons of each type of kitchen tile. Another important factor to keep in mind is the nature of tile’s surface whether it is slippery or non-slippery. Choose a surface that is non-slippery to avoid unnecessary fall and bruises. With plethora of types of kitchen tiles, the choice is endless. So, indulge in giving your kitchen that perfect look as you have envisioned in your dream. 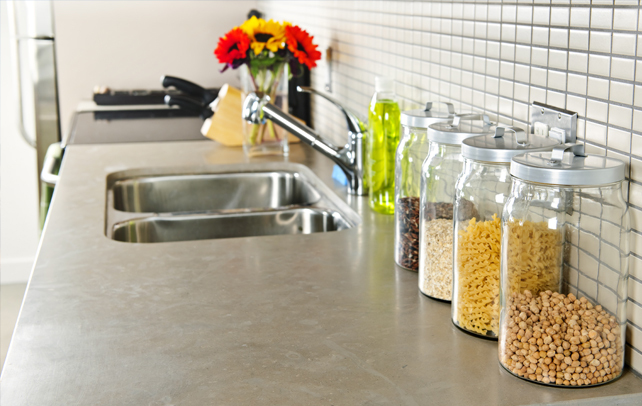 Give your kitchen a picture perfect look.